Offense: Utah has had thier struggles in their first year as a member of the Pac-12. They only score 24.6 points a game, and rank 99th in the country in passing. Backup Jon Hays is the quarterback and he led the Utes to a four game winning streak late in the year, only to lost to Colorado in the final game of the season. Utah will try to run the ball and the best player on the team, John White IV will do just that. The junior has rushed for over 1400 yards and 14 touchdowns.He runs behind a very good line, led by tackles Tony Bergstrom and John Cullen. Georgia Tech will run the ball. Then they will run the ball again. Then, maybe some more. That is the philosophy under head coach Paul Johnson. The Yellow Jackets run the triple option and rank 2nd in the country rushing the ball, averaging about 317 yards a game on the ground. Tevin Washington is the quarterback, the leading passer, and the leading rusher. Fullback David Sims will get many carries and is second on the team in rushing. They will pass at times and when they do, Stephen Hill is the number 1 threat. The Yellow Jackets score 35 points a game, but will be facing one of the better defenses that they have faced all year. Defense: Utah has a defense that gives up under 20 points a game and they do it in one of the best offensive conferences in the country. The defensive line is very strong, and it will look to stop the strong Yellow Jacket running game. DE Derrick Shelby and DT Star Lotulelei anchor that group. The linebackers, who also will be key, are Chaz Walker, Matt Martinez, and Trevor Reiley. Safeties Brian Blechen and Eric Rowe are strong in the secondary and will have to help against the run. Utah's defense is very,very good and it will be difficult for Georgia Tech to attack it. Georgia Tech has been up and down this year. They struggle stopping the run, which could smell trouble in this one. Outside linebacker Jeremiah Attaochu is a force who will always be going. Inside linebacker Julian Burnett is a strong run stopper in the middle. They should have success against a Utah offense that has its struggles. The Pick: I like Georgia Tech to win this game. It will be a close, low scoring game, but Georgia Tech pulls it out. They have a better offense than the Utes, and it will lead the the Yellow Jackets' 9th win. If you agree or disagree let me know why by tweeting me @bowlseason or emailing me at ryzim22@yahoo.com . I'll post them if you send them. Dirk Facer, of The Deseret News in Salt Lake City, answered some questions about Utah for us. BS: The Utes were an inconsistent 7-5 in their first year in the Pac-12. How would you rate this season overall for Utah? Dirk Facer: Just when it appeared the Utes had turned things around — overcoming eight season-ending injuries along the way — they dropped a 17-14 decision at home to Colorado on Nov. 25. The loss turned out costing them a berth in the Pac-12 championship game and a few other things like a four-game win streak and a winning conference record. It put a damper on a rollercoaster campaign. The season, though, is still considered a success with a ninth straight bowl appearance. A lack of depth moving from the Mountain West Conference was evident. BS: The offense has struggled mightily. Talk about the quarterback situation and who are the key players on this unit? Dirk Facer: The loss of starting quarterback Jordan Wynn to a shoulder injury on Oct. 1 against Washington proved to be troublesome in a number of ways. Junior backup Jon Hays, who was ticketed to play at Nebraska-Omaha before the school dropped football, stepped in and eventually led Utah to four straight victories. Junior running back John White IV carried the biggest load, however, with 1,485 yards rushing on 290 carries. Starting tackles Tony Bergstrom and John Cullen lead the line. The seniors earned all-conference honors after opening things up for White. BS: The defense has been great, giving up under 20 points a game. Who and what makes this group so successful? Dirk Facer: Senior defensive end Derrick Shelby and junior nose tackle Star Lotulelei, who were first team all-conference honorees, headline a squad that led the Pac-12 in several defensive categories. Seven others — Dave Kruger, Joe Kruger, Tevita Finau, Nai Fotu, James Aiono, Nate Fakahafua and LT Tuipolotu — also saw considerable time up front. The Utes are also solid at linebacker with Chaz Walker, Matt Martinez and Trevor Reilly. The secondary features talented safeties Brian Blechen and Eric Rowe, as well as speedy cornerbacks Conroy Black and Ryan Lacy. Dirk Facer: Get ready to meet “The Wolfman.” Utah’s star running back is small in stature at 5-foot-8, but big in racking up yardage. He needs 104 yards to surpass Carl Monroe’s 1982 single-season school record of 1,507. White suffered a high ankle sprain in the loss to Colorado. However, he’s expected to be 100 percent by the time Utah and Georgia Tech tangle in the Sun Bowl on New Year’s Eve. Another player to watch is Lotulelei. He’s the “Star” of one of the nation’s premier run defenses. How they fare against Georgia Tech’s triple-option attack will likely determine the outcome. Ken Sugiura, of the Atlanta Journal-Constitution answered some questions for us about Georgia Tech. BS: The Yellow Jackets started 6-0, but limped to an 8-4 finish. What changed over the second half of the season and how would you assess the season overall? Ken Sugiura: A few things happened, probably the most pertinent being that the schedule got considerably tougher. The first six games were against an FCS team and five FBS teams that finished 20-40. The last six were against FBS teams that were 48-27, including Clemson, Virginia Tech and Georgia, all division or conference champions. The tougher schedule exposed weaknesses defensively both against the pass and run, on special teams and in the passing game. Defenses also keyed on quarterback Tevin Washington on the option running game, making it more difficult to break open the explosive plays that had been common in the first half of the season. BS: The offense once again finished toward the top of the country in rushing. Talk about the offense overall and please include some key players. Ken Sugiura: Even with several new parts, the offense continued to roll along and put up stunning rushing numbers. 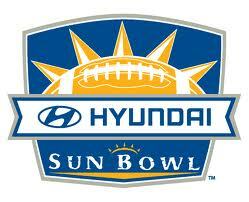 They head into the Sun Bowl ranked third in the country in rushing. Washington has shown the potential to be a capable and efficient passer, but has had problems at times with accuracy. B-backs (fullbacks) David Sims and Preston Lyons split carries and have been solid pluggers, but for a few different reasons have not had the productivity and big plays that the position normally creates in coach Paul Johnson's offense. A-backs (wingbacks) Orwin Smith, Roddy Jones and Embry Peeples all have speed and can cause problems on the perimeter. Wide receivers Stephen Hill and Tyler Melton are capable receivers and excellent downfield blockers. The offensive line's top player is All-ACC pick Omoregie Uzzi at guard. BS: The defense had some struggles, particularly over the second half of the season. In what areas do they struggle and who are the guys that they depend on? Ken Sugiura: The defense had particular problems in the early and middle part of the year stopping the run, but showed improvement towards the end. On the other hand, the pass defense slid over the course of the year, probably in part due to the increased level of competition. The 3-4 scheme often couldn't create pass-rush pressure with the three linemen and blitzes were picked up too frequently, giving quarterbacks time to throw. The Yellow Jackets have a number of talented defensive backs, starting with corners Rod Sweeting, Louis Young and Jemea Thomas, but breakdowns in coverage repeatedly cost them. The top players on the unit are outside linebacker Jeremiah Attaochu, a non-stop rush linebacker with superior athletic ability, and inside linebacker Julian Burnett, an undersized but powerful run stopper. Ken Sugiura: Inside linebacker Quayshawn Nealy has received increasing playing time as the season has progressed, taking over as the starter next to Burnett. Nealy has speed and hitting ability and is continuing to learn the scheme. With extra time to absorb the defense prior to the bowl game, Nealy may be ready to show he's taken another big step. Thanks a lot to Ken Sugiura. Check his work out at ajc.com .